Written on the back: Nettie Montgomery, I think her father was Henry. Black and white photograph of the old Magnetawan Post Office. Its a two story wooden building. There are steps leading up to the entrance and a deck on either side of the entrance. There's a woman in a dress standing on the deck at the entrance of the Post Office. Black and white portrait photograph of Bertha Jane Arthurs Golden. She is wearing a fur trimmed coat and a hat. It is not clear what type of backdrop is behind her. 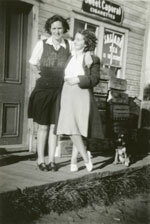 On the back of the photograph, "Kate Scarr, Lillian Follick in front of Scarr's Store at Foot of Hill", written in pen. Black and white portrait photograph of Mrs. Parkes. She is wearing a black kerchief on her head. She's also wearing a black dress. Handwritten on the back of the picture: "Aggie Buchanan, Mrs. MacChristie - nee Harriet Abar, Mrs. R. Poole - nee Lettie McCabe, Mrs. Jack Christie - nee Jenny Moir." Black and white photograph of the first Karbehuwe Cottage on Lake Whitestone. The log cabin was located at the south end of the lake. This building would later be replaced by wooden frame building. At the entrance to the cottage there's a woman sweeping the stoop. Black and white photograph of a woman sitting on a wooden box on a wooden dock at Karbehuwe cabin on Lake Whitestone. The woman is facing the water making her face obscured. The dock is sitting on rocks. Across the lake there's a forest. On the back of the photograph, "Sucker fishy Dear River 1950's," is handwritten in pencil. On the back of the photograph, "Jim, Hilda & June Catching suckers with their bare hands 1950's," is handwritten in pencil. Black and white photograph of men and women in formal dress. This photograph was taken in the Wattenwyl area, circa 1900. Black and white portrait photograph of Annie and Katie Bottomley. The woman on the left is standing and the woman on the right is sitting. They are both dressed in white. Black and white photograph of an elderly woman, Thomas Bottomley, sitting in a chair in front of a screen in a portrait studio. Black and white photograph of a large group of women. There are three rows of people. They're in a house or a hall. There's a framed picture behind the women. This picture may be a clue to what this group is. This is a black and white portrait of Miss Goode. Her head and upper body are visible, and she's looking towards the camera. She's wearing a white shirt with a necklace around her neck. Black and white portrait photograph of Mrs. Frank Quirt facing right. She is wearing a black dress. The dress has an eight-pointed broach. She is also wearing a long silver coloured necklace. Black and white portrait photograph of a woman, Mrs. Mary Church, and a boy, Arthur. The woman was one of the pioneers in the Sundridge area. Mrs. Church is wearing a black dress. Arthur is wearing a black suit.